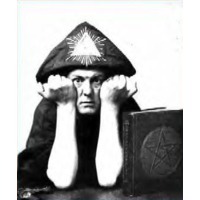 Aleister Crowley (pronounced /ˈkroʊli/; 12 October 1875 – 1 December 1947), born Edward Alexander Crowley, and also known as both Frater Perdurabo and The Great Beast, was an influential English occultist, mystic and ceremonial magician, responsible for founding the religious philosophy of Thelema. He was also successful in various other fields, including mountaineering, chess and poetry, and it has also been alleged that he was a spy for the British government. In his role as the founder of the Thelemite faith, he came to see himself as the prophet who was entrusted with informing humanity that it was entering the new Aeon of Horus in the early twentieth century. Born into a wealthy upper class family, as a young man he became an influential member of the esoteric Hermetic Order of the Golden Dawn after befriending the order's leader, Samuel Liddell MacGregor Mathers. Subsequently believing that he was being contacted by his Holy Guardian Angel, an entity known as Aiwass, whilst staying in Egypt in 1904, he received a text known as The Book of the Law from what he believed was a divine source, and around which he would come to develop his new religion of Thelema. He would go on to found his own occult society, the A∴A∴ and eventually rose to become a leader of Ordo Templi Orientis (O.T.O. ), before founding a religious commune in Cefalu known as the Abbey of Thelema, which he led from 1920 through till 1923. Crowley was also a bisexual, a recreational drug experimenter and social critic. In many of these roles he "was in revolt against the moral and religious values of his time", espousing a form of libertinism based upon the rule of "Do What Thou Wilt". Because of this, he gained widespread notoriety during his lifetime, and was denounced in the popular press of the day as "the wickedest man in the world."